This report was produced in collaboration with the Broader, Bolder Approach to Education. Persistently large achievement gaps between high-social-class and low-social-class children in America, and the disparities in opportunity that drive these achievement gaps, threaten the very notion of the American Dream. The lack of true equality of opportunity calls for much more comprehensive interventions to tackle those gaps. In this brief, we focus on interventions at the school and community levels, including support for parents. However, the need for those interventions would be substantially reduced and students’ odds of success greatly enhanced if we also addressed the broader structural forces that drive poverty and inequality and hold back a growing number of our children. This brief describes the type and size of early achievement gaps—and trends in them over time—and points to effective and comprehensive educational policies to avert and narrow them. It is based on key findings from Education Inequalities at the School Starting Gate: Gaps, Trends, and Strategies to Address Them, a study combining statistical analyses of performance gaps and qualitative analyses of school districts that are piloting promising strategies for closing these achievement gaps. The quantitative analyses (on the persistence of gaps over time and their sensitivity to individual and family characteristics and to educational experiences) are based on data from two representative national samples of children who started kindergarten in 1998 and in 2010. (Kindergarten classes separated by 12 years constitute an “academic generation” because the eldest cohort is in its graduation year when the youngest cohort is beginning kindergarten.) We compare children of low socioeconomic status (SES), as determined by parents’ educational attainment and job status as well as household income, with their higher-SES peers. In an effort to identify more effective policy solutions, we also look at how and why performance gaps and children’s circumstances have changed over time. Skills measured at kindergarten entry include both cognitive skills (reading and math) and noncognitive skills (self-control and approaches to learning). Interventions to close performance gaps must start early in children’s lives because skill and performance gaps take root before children enter kindergarten and do not go away. Our analyses find that children who entered kindergarten in 2010 were not at all equally prepared for school, with social class being a powerful factor in their abilities at kindergarten entry. High-SES children score significantly higher in reading and math than their low-SES peers; gaps in both subjects are larger than a full standard deviation. High-SES children also score significantly higher on social and emotional skills, through the gaps are smaller (about one-quarter to one-half a standard deviation). Other research has shown that early learning gaps do not go away. We must reassess the interventions we are already providing because performance gaps did not narrow over an academic cohort (1998–2010). Our analysis finds little change from 1998 to 2010 in the gaps in readiness between high-SES and low-SES children. This suggests that policy improvements enacted over that period were insufficient to overcome more challenging economic conditions. National economic trends are exacerbating inequalities and creating challenging conditions for children at the bottom of the social class ladder. Despite increasing economic pressures, low-SES parents have increased their involvement in and personal investments in their children’s early education through play, reading, and more. Moreover, public investments in policies meant to provide children with healthy beginnings—such as access to prenatal care, state pre-K programs, health screenings, and nutrition programs—increased modestly in the 2000s. However, these positive factors combined were not sufficient to narrow gaps in face of increased economic headwinds. Comprehensive, community-level education strategies that begin addressing children’s needs before kindergarten show promise in narrowing these gaps. Such strategies should be further explored and adapted in more districts, and proven interventions should be widely scaled up. A number of diverse school districts have launched comprehensive education initiatives that use community-building to tackle poverty-related impediments to learning and student success. Though each is tailored to a district’s specific needs, the initiatives share common elements that boost early achievement and sustain supports throughout children’s academic trajectories. These are supports that benefit all children but that are more difficult for low-income and minority students to gain access to. These supports include investments in supports for new parents; access to child care, quality pre-K, and other early childhood education experiences; attention to the full range of students’ needs, including health and nutrition support and enriching opportunities both within and outside of the classroom; efforts to reduce student absenteeism; strong parent and community engagement; and targeted strategies to boost college, career, and civic readiness. These comprehensive interventions are starting to narrow early achievement gaps and boost test scores, increase measures of student well-being, and lead to higher rates of advanced course placement and high school graduation among low-income and minority students. As such, they offer promising strategies for other districts and guidance for state and local policymakers to design policies that can advance and expand such efforts. Why does growing US income inequality heighten the need to tackle education gaps? This brief explores the interplay between educational outcomes, socioeconomic status, and social mobility. As the analyses show, there is a close connection between one’s economic birthright and educational achievement. Thus the combination of growing economic inequality and inequality-based achievement gaps casts doubt on the notion of an “equality of opportunity” that serves as the basis for the American Dream. Of course, inequalities in both opportunity and outcomes along the lines of race and social class have been studied extensively. Research shows that achievement gaps begin early and often persist throughout students’ K–12 years and beyond, and that these gaps are much larger in the United States than in comparable countries. Studies have also shed some light on how challenges related to low-income and minority status contribute to these gaps. But few studies have explored changes in the gaps across cohorts, and little is known about what drives these changes. Understanding these changes would tell us whether and to what extent strategies to narrow the gaps are working. When do performance gaps begin? We know that children’s skill levels at school entry play a critical role in determining how they fare not just in kindergarten, but throughout their school years and their lives. And the set of skills that matter is broad. Scholars and policymakers increasingly agree with educators and parents’ assertions that critical school and life skills include not just traditional academic skills, like math and reading, but also social and emotional skills, such as critical thinking, creativity, problem-solving, persistence, and self-control.6 In fact, these social and emotional skills are key to academic learning and broader child development. To determine how prepared to learn children are when they enter kindergarten and the size and scope of gaps in that readiness across social classes, we analyze data from two cohorts: children who started kindergarten in the fall of 2010 and children who started in 1998. These data are from the Early Childhood Longitudinal Studies (ECLS) of the Kindergarten Classes of 1998–1999 and 2010–2011 (from the National Center for Education Statistics). How do we measure social and emotional skills? In addition to measuring cognitive skills such as reading and math skills, the Early Childhood Longitudinal Studies include assessments of children’s noncognitive, or social and emotional, skills. Social and emotional skills are constructs based on children’s attitudes and behaviors and are measured by teacher and parent assessments. Self-control. As rated by teachers, this skill reflects the ability to control behavior by respecting the property rights of others, the ability to control one’s temper, willingness to accept peer ideas for group activities, and the ability to respond appropriately to pressure from peers. As rated by parents, it reflects the ability to control behavior by refraining from fighting, arguing, throwing tantrums, and getting angry. Approaches to learning. As rated by teachers, this skill reflects the presence of organizational skills, curiosity, independence, adaptability, persistence in completing tasks, and the ability to focus and follow classroom rules. As rated by parents, it reflects persistence, curiosity, focus, helpfulness, and creativity in work and play. Using a measure of socioeconomic status (SES) that takes into account parents’ educational attainment and job status as well as household income, we divide the children in each cohort into five SES quintiles or fifths. We compare both the cognitive and noncognitve (social and emotional) skills of those in the top SES fifth (high-SES children) with those of their counterparts at each subsequent step down the ladder, focusing specifically on comparisons with the bottom SES fifth (low-SES children). It is this measure of relative advantage (the average performance of children in the top fifth of the SES distribution compared with the average performance of children in the bottom fifth) that we are talking about when we refer to “readiness gaps.” Skills measured include reading and mathematics, along with self-control and approaches to learning as reported by both teachers and parents. How large are ‘inequalities at the starting gate’ for the kindergarten class of 2010–2011? Children who entered kindergarten in 2010 were prepared for school to widely varying degrees, with social class being a powerful factor in their abilities at kindergarten entry. The graphics below illustrate the magnitude of the readiness gaps by social class, and Figure A later in this brief provides exact data on the size of the high-to-low-SES gaps. Each step up the SES ladder puts a child at further advantage, with those at the high end of the SES distribution about as far ahead of the middle SES group as the middle SES group is ahead of their low-SES peers. How do factors known to enhance or impede school readiness affect skills gaps for the kindergarten class of 2010–2011? Research documents that a portion of the gap in school readiness between high- and low-SES children is likely due to factors that are correlated with socioeconomic status but are not directly attributable to the parental income, job status, and mother’s education level that make up our SES metric. For example, fewer low-SES children than high-SES children have access to center-based pre-K programs; therefore, their school readiness is likely to be lower than the readiness of students who do have access to such programs. Our analyses also document stark disparities in child and family characteristics and other factors that are known to affect school readiness.9 Compared with their high-SES peers, low-SES kindergartners are less likely to speak English at home, to live with two parents, to have been in center-based pre-K care in the previous year, and to have engaged in early literacy practices at home. Among children in the low-SES group, fully half are Hispanic, just under a quarter are white, 20 percent are black, and just 2.5 percent are Asian. These differences across SES groups help us to better understand the relationship between skills gaps and the factors that affect school readiness. We make “statistical adjustments” to our model by adding controls for child and family characteristics (gender, race/ethnicity, whether English is the primary language spoken at home, disability, age, whether the child lives with two parents) and for early educational and play activities (whether the child had access to center-based pre-K care, the child’s level of participation in literacy/reading activities, and how many books the child has access to at home). We also add controls for parental expectations of children’s educational attainment (whether they expect their children’s highest level of education attained will be a high school diploma or less, some college or vocational studies, a bachelor’s degree, or an advanced degree). Taking these factors into consideration does shrink the gaps, though they remain large across all outcomes. Taking into account the full range of family and other controls—in the adjusted model—cuts the reading and math skills gaps between high-SES and low-SES students in the kindergarten class of 2010–2011 roughly in half. Including the controls also narrows the gaps in social and emotional skills, though less uniformly. Adding all of the controls reduces the high-to-low-SES skills gaps for approaches to learning as reported by teachers by 20 percent, but shrinks the gap in that skill as reported by parents nearly three times as much, by 56 percent. For self-control as reported by both parents and teachers, adding all the controls reduces the gap by about one-third. Interestingly, other activities parents do with their children—like playing sports and doing arts and crafts or puzzles—are negatively associated with reading and math skills but are strongly positively linked to approaches to learning and self-control. One explanation for the former, negative finding is that time devoted to activities not specifically geared toward boosting academic skills detracts from parents’ time to help their children enhance those skills. As to the latter, positive finding, it could be due to parents who are more inclined to participate in their children’s early play and education being more likely to perceive that their engagement has an impact on their children’s skills and thus to report that. How have the skills gaps between high- and low-SES children changed from 1998 to 2010 and what might have led to these changes? Unadjusted gaps—without controls—represent “real-life” gaps: the differences in skills observed when children start school reflect the advantages that children of higher socioeconomic status tend to have relative to their low-SES counterparts. That is why, when we want to see if things have changed for low-SES children over one academic generation, we look at changes in the unadjusted school readiness gaps from 1998 to 2010. But to understand why things have or have not changed—and the implications of the trends over time—the sensitivity of the gaps to the adjustments provide some answers. Perhaps surprisingly, the “real-life” SES-based skills gaps largely remained the same from one generation to the next, as shown in Figure A. 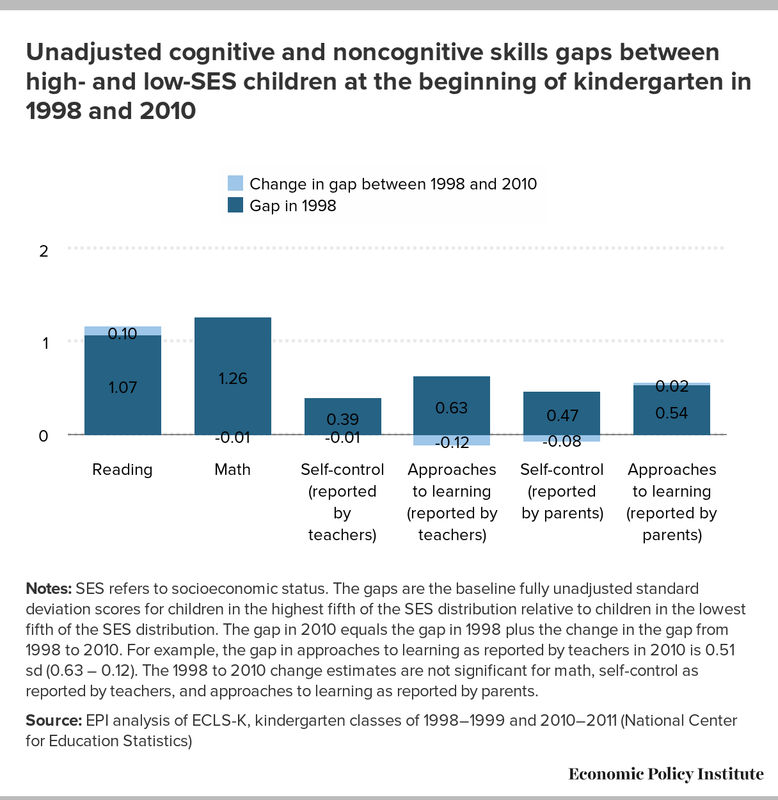 While gaps between high-SES and low-SES children are large and significant for both the kindergarten classes of 1998–1999 and 2010–2011 across the range of skills, among cognitive skills, the only increase in the unadjusted skills gap was in reading, which increased by a modest one tenth of a standard deviation. Gaps in approaches to learning as reported by teachers and self-control as report by parents shrank by about the same amount, while gaps in math, self-control as reported by teachers, and approaches to learning as reported by parents held steady over the 12-year period. Notes: SES refers to socioeconomic status. The gaps are the baseline fully unadjusted standard deviation scores for children in the highest fifth of the SES distribution relative to children in the lowest fifth of the SES distribution. The gap in 2010 equals the gap in 1998 plus the change in the gap from 1998 to 2010. For example, the gap in approaches to learning as reported by teachers in 2010 is 0.51 sd (0.63 – 0.12). The 1998 to 2010 change estimates are not significant for math, self-control as reported by teachers, and approaches to learning as reported by parents. Have we really made no progress? Or are competing forces balancing one another? Actually, being able to hold gaps steady should be seen as a partial victory. The challenging economic environment would predict significant increases in school readiness gaps. The fact that this did not occur indicates the influence of other, positive, noneconomic factors. These economic headwinds for low-social-class families are reflected in our data across SES groups. For children in the kindergarten class of 2010, their most formative years—from birth to kindergarten—coincided with the worst economic downturn since the Great Depression, which led to very high rates of unemployment. In contrast, children in the kindergarten class of 1998 enjoyed a booming economy—nearly full employment and decent wage growth—during their formative years. This stark increase in disadvantage is evident in the data describing the second cohort of low-SES children. Relative to 1998, low-SES children who entered kindergarten in 2010 were much more likely to be poor; the share of low-SES children living in poverty grew from 71 percent to nearly 85 percent. Low-SES children were also more likely to live in a non-English-speaking home (with the share increasing from 30 percent to 40 percent) and to not be living with two parents (with the share increasing from less than half to more than half). But the skills gaps did not increase. So other factors that enhance school readiness must have offset, at least in part, the effects of the negative factors described above. One positive factor could be the substantial increases in state investments in pre-K over this period. But low-SES children did not benefit greatly from these investments. They were no more likely in 2010 than in 1998 to attend center-based pre-K, and while state pre-K program quality did increase over that period, that increase was uneven and, in the four largest states, quality remained extremely low in three (California, Florida, and Texas); in the fourth (New York), quality did not reach the level experts consider key to delivering full school readiness benefits. So state pre-K investments are unlikely to have been a significant factor in holding gaps steady.10 Rather, a major factor seems to be a set of personal investments that low-SES parents made in their children. Low-SES children had more books in their homes in 2010 versus in 1998 and engaged in more enriching activities with their parents. Also, their parents had substantially higher expectations for their achievement (hoping they would attain at least a bachelor’s degree and possibly an advanced degree). Finally, the 2010 low-SES mothers themselves had slightly higher educational attainment than their 1998 counterparts. These increases in turn suggest that critical knowledge about child development and how to nurture it became more widely known in this period and that low-SES parents disproportionately acted on it. There are many other factors that affect children’s school readiness that may have changed over the time period studied but for which we do not have data. If, for example, women had better access to prenatal care, that would have helped children’s health, and thus their school readiness,11 from 1998 to 2010—but we cannot control for that in our study. What do the data on gaps tell us about interventions that can work? “Interventions”—societal and familial—do work. We know this because these interventions contribute positively to readiness (in most cases) and help narrow gaps in our models; we also infer this because early achievement gaps did not grow despite an increase in the number of families in poverty and with other characteristics that are known to impede school readiness. By adjusting our model to control for various factors, we can identify those that have a consistent—or in some cases, growing—influence on children’s readiness and thus hold the most promise to narrow gaps for the next generation of kindergartners. Having more books at home also continues to have a positive influence on early skills, albeit a very small influence that hasn’t changed over time. A composite of reading/literacy activities has a strong, positive relationship with virtually all skills. This relationship is stable over time for reading and math skills and for noncognitive skills as assessed by teachers (although the influence of reading and literacy activities has shrunk for noncognitive skills assessed by parents, as we explain later). Across the SES spectrum, parents’ expectations for their children’s educational attainment increased. Such expectations are associated with improved skills. Moreover, unlike other controls whose impact held steady, this one became more powerful. As a group, however, these controls accounted for a smaller part of the gap in 2010 than they did in 1998. This change could indicate that these factors no longer capture, to the same extent as they had, what parents are doing to nurture their children’s development, or that other programs or services that are helping children are not included in these metrics. For example, some educational activities (such as digital education games) are not included in these metrics because they did not exist in 1998, but these activities likely had an influence on children’s skills development. It may also be the case that high-SES parents engaged in more enriching activities in 2010 relative to 1998 that were not captured either because the activities exceeded the data “ceiling” (e.g., parents’ own more books than the maximum number that can be checked off in the ECLS survey) or because they are not included in the survey (e.g., travel). The diminished influence of the controls could also be attributable to the poorer economic conditions (high unemployment and low wage growth) in the years leading up to 2010 that resulted in a greater share of low-SES families being in poverty in 2010 then in 1998. Whatever the reason or combination of reasons, the diminished influence of the controls in total should worry both researchers and policymakers. This weakening influence makes it harder to pinpoint what drives SES-based gaps in school readiness, and it suggests that the policy interventions we measured are less able to narrow the gaps than they were formerly. So how do we help children in low-SES families thrive in school and in life? *Indicates that while the initiative covers the entire county or region, a portion of the county or region receives more intensive services. **Indicates that the initiative will cover the entire school district under plans to expand. What do comprehensive or “whole-child” approaches to education include? Health and nutrition components. Programs that support students’ physical and mental health, as well as their nutrition, boost and sustain early gains by helping keep students focused, reducing chronic absence, and boosting students’ academic performance.15 These programs include partnerships with community providers, school-based health clinics, and school-based wellness programs. Enriching, hands-on classroom experiences. Curricula that are student-centered and that get students active better nurture and develop all domains of learning. How have case study districts invested in early childhood care and education? While early childhood education is widely recognized as a critical means of advancing school readiness, and almost every state now invests at least minimally in pre-K programs for disadvantaged children, access is far from universal, quality is very uneven, and pre-K is only one of several early childhood interventions that are needed. (Other interventions are described below.) Most of the case study districts have used creative strategies and funding mechanisms to enhance state programs or fill in holes in pre-K access. Where state programs already provide quality early education for all children from low-income families, as in Kentucky, the whole child initiative can leverage freed-up local resources to fund early childhood specialists who provide coaching, professional development, and support for pre-K and Head Start teachers, as well as in-home tutoring for students over the summer. Where state pre-K programs are weak or patchwork, local initiatives can fill in those holes. Austin, Texas; Pea Ridge, Arkansas; and Joplin, Missouri, have leveraged district and/or private funds to expand access to high-quality pre-K for their most vulnerable young children. Pea Ridge, for example, sought a foundation grant to establish its program; seats for low-income students are funded through a combination of grant money and paid seats (for preschoolers from higher-income families). Because parents are their children’s first and most important teachers, earlier efforts tend to focus on engaging parents and working with parents and children together. In Minneapolis’s Northside Achievement Zone, parents have access to “College Bound Babies,” a parenting class that teaches early literacy, numeracy, and positive discipline skills, and the zone’s “Foundations” program helps empower parents to be strong advocates for their children and their children’s schools. In Joplin and Vancouver, kits for new parents are delivered to hospitals with information on child development, activities to try at home, and links to community resources. Other investments in young children and their families include outdoor play-and-learn opportunities for parents and their children such as Clay County, Kentucky’s Community Storywalk and Joplin’s Born Learning Trail. How are districts investing in K–12 strategies to sustain and amplify early childhood investments? 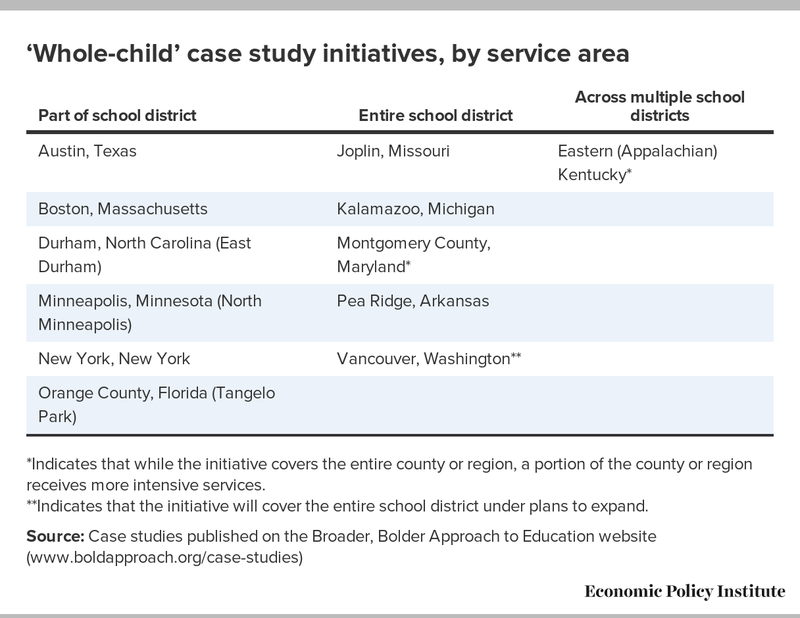 These 12 case study districts bring to bear a broad set of interventions to sustain the gains from whole-child approaches as children transition to kindergarten and advance through elementary, middle, and high school. Components include enriching curricula and in-class experiences; lessons that are aligned with hands-on out-of-school activities that are available to all students; mentoring and tutoring to ensure strong adult–student relationships; and targeted strategies designed to improve students’ readiness for college, careers, and civic engagement. A number of districts focus in particular on helping students—many of whom will be the first in their families to go to college—prepare for and make that transition. Strategies include early exposure to postsecondary campuses for Joplin and Pea Ridge students; programs to help middle-school students in Joplin, Missouri, and Vancouver, Washington transition to high school; and clubs and specialized courses that teach organizational and social skills to students in Vancouver, Washington, and Montgomery County, Maryland. Providing students and parents with health care through partnerships with local doctors and hospitals and in-school health clinics, expanding school meals programs, and connecting families with food and clothing pantries complement these K–12 strategies. When the full range of children’s needs is met, they are mentally and emotionally better able to focus.19 And extending supports to the entire family—as East Durham, North Carolina, does by referring parents to and/or providing nutrition counseling programs, cooking demonstrations, Zumba classes, and walking groups—increases parents’ capacity to be better partners in their children’s education. Indeed, engaging parents, perhaps the greatest challenge in most high-poverty schools and districts, is a hallmark of strength in these communities. In Vancouver and New York City, the whole-child education experience is delivered by full-service community schools (community schools are public schools that serve as hubs for the provision of academic, health, and social services to students and families). Community schools in Vancouver and New York City specialize in outreach and engagement, drawing on parental input to shape school policies and practices and providing parents with opportunities to collaborate. Policy (and financial) incentives established in recent years have prompted most other schools, in contrast, to focus heavily on a narrow set of academic factors and associated assessments. Schools with this limited focus often fail to ensure that after-school and summer enrichment programs are accessible to low-income students and neglect to build strong teacher–student relationships and address the full range of children’s needs, all of which are core characteristics of whole-child K–12 strategies. How can we tell that the investments are paying off? Providing children and their families with a broad range of supports from birth through 12th grade (and, in some cases, beyond) has helped these districts make progress toward a range of goals. In addition to traditional measures of progress, like higher scores on standardized tests or higher districtwide graduation rates, these districts are looking to improve kindergarten readiness, enhance student and parent engagement in schools, and narrow income- and race-based gaps in students’ access to tools that prepare them for college, careers, and civic life. In addition to tracking student progress toward the broader set of goals, the data they collect on these measures enable them to continually improve their work and better target student supports. Students in these whole-child districts tend to be better prepared for kindergarten, as measured by their development across a range of academic, social, and behavioral domains. They also tend to score higher on standardized tests and to graduate at higher rates than their peers in comparable districts. Just as important, the strategies have improved students’ engagement and their health and well-being; increased parent engagement in their children’s education and schools; and better prepared students for college, careers, and civic engagement. The students’ enhanced life skills, in particular, are likely attributable in large part to these districts’ emphasis on enriching experiences for all students, in contrast to providing students in wealthy schools with enrichment while subjecting students in high-poverty schools to narrow curricula and activities focused on improving their performance on standardized tests. Finally, these districts are narrowing race- and income-based achievement gaps, in stark contrast to rapidly growing K–12 achievement gaps at the national level between wealthy and poor students. Kindergarten readiness: An assessment of 31 participants in East Durham’s Stepping Stones summer readiness program found that while 83 percent were not ready for kindergarten when they entered the program (based on a pre-test of their academic, self-regulation, social expression, and motor skills), only 17 percent were deemed not ready after completing the program. And similar tracking of prekindergartners in Minneapolis’s Northside Achievement Zone (NAZ) finds that NAZ students are 14 percentage points more likely than their non-NAZ peers to be ready for kindergarten. Standardized test scores: Elementary school students participating in Boston’s City Connects program have much higher scores than their peers outside the program in both reading and math on the Stanford Achievement Test as well as on state standardized tests. Despite being poorer, on average, than other Kentucky students, students in Kentucky’s Eastern Promise Neighborhood counties had larger gains in test scores in both reading and math than their state peers (gains of 7.3 and 7.0 percent compared with 5.3 and 4.4 percent, respectively). Student engagement: African American and Hispanic high school students in Joplin, Missouri, closed the attendance gap with their white peers, with the district’s overall attendance rate rising above 95 percent. And in Pea Ridge, Arkansas, the “youngest” of the initiatives studied, a set of resources—donations of boots and clothing, health screenings, and funds for licensing exams—have enabled students to participate in extracurricular and career-training activities that would otherwise have been out of reach. Parent engagement: A six-year study of Children’s Aid Society community schools in New York City found that parents were more involved, took more responsibility for their children’s education, and were more present in the schools than were parents of children in comparison schools. And in the eastern Kentucky region served by Partners for Education, parents have translated their leadership training experiences into joining school counsels and successfully running for school boards. College, career, and civic/life readiness: A growing number of poverty-affected students in Vancouver, Washington, are completing the district’s most rigorous coursework: from 2007 to 2015, overall enrollment in Advanced Placement (AP) courses increased 67 percent, while the increase among low-income students was nearly 200 percent. A similar pattern was seen for extended (five-year) graduation rates: large gains overall, with disproportionate gains for students of color. These data suggest that high-level course placements translate into longer-term dividends. Parallel gains in Kalamazoo are translating into promising futures for African American girls in that city: these girls are graduating high school at higher rates than their state-level peers, and 85 percent of those who graduate go on to college. These achievements are drawing the attention of other districts and even state leaders, who have adapted the comprehensive approaches laid out above to improve other high-needs schools. What is the ‘good news’ emerging from our research? Why did gaps stay the same rather than radically expanding? A likely factor is that, over the period studied, parents across all social class groups became more involved in their young children’s early education, with the increase in engagement being especially pronounced among low-SES parents. While low-SES parents in 2010 were no more likely to enroll their children in center-based pre-K than their 1998 counterparts, they were more likely to have read regularly to their infants, toddlers, and preschoolers and to have sung to them and played games with them. The 2010 parents also had significantly higher expectations for their children’s educational attainment, and mothers themselves were better educated. All of these factors are associated with higher achievement for children. This change occurring within an academic generation suggests that today’s parents are more aware of the importance of children’s early years and doing more of what developing brain research indicates they need to do. In turn, this increased awareness indicates that information about early brain development is more widely and effectively disseminated than it was for the 1998–1999 cohort. Also, as the case studies indicate, some communities are embracing systems of comprehensive enrichment and supports to close skills gaps based on social class and to provide children with a more authentic equality of opportunity. By setting more expansive goals and implementing ways to track progress toward these goals, these districts are creating a body of knowledge about strategies that work. This guidance is timely, given that the federal Every Student Succeeds Act (ESSA) asks states, districts, and schools to take the lead in shaping education improvement strategies and holds them accountable not just for students’ growth in traditional academic subjects but in social and emotional skills as well. As such, many of these whole-child approaches now serve as role models for other districts or for entire regions, and a few are beginning to influence state policy as well. What is the ‘bad news’ and how can we respond to it? Despite the positive trends outlined above—the growing awareness of the importance of the first years of life in child development, increased understanding of the serious impact of child poverty on that development, and the expansion of pre-K programs nationwide—gaps between the school readiness of low-SES children and their more advantaged peers have not shrunk. The persistence of these large gaps indicates that policy responses at all levels of government are not commensurate to the scale of the problem. Pre-K programs have expanded over the past decade but have done so slowly and unevenly: both access and quality are still wildly disparate across states and overall availability is severely insufficient.24 Home visiting programs (to support pregnant women and parents of infants and toddlers) and quality child care are still in too-short supply.25 Child poverty has increased sharply, as has its concentration, and the schools into which the most disadvantaged children enter face increasing economic and racial segregation but even fewer resources than in 1998 to deal with them.26 In addition, while momentum to enact “Broader, Bolder Approaches” to education is growing, such initiatives are expanding slowly, still reaching too few students, and not gaining steam nearly as quickly as children, and our country, need them to. All these interventions—at both the school and community levels—are critically needed, given significant and persistent early education gaps by social class. But even if these interventions were sufficient, integrated, and sustained over time, we would still be far from attaining the level and scale of supports that are demanded: this set of strategies represents, at best, a way to counter some of the consequences of the highly inequitable economic situation that U.S. policy choices have created over the past few decades. These community-level whole-child approaches would alleviate many disparities in opportunity and thus narrow achievement gaps. But closing those gaps in opportunity and achievement, which scholars and policymakers alike have long viewed as one of our education system’s primary goals, requires tackling the broader economic problems that drive these gaps. In other words, there is only so much that even comprehensive, well-designed interventions at the school and community levels can do to counter a widening gulf in American society between haves and have-nots that leaves a shrinking number of families with incomes that are adequate to their needs. Ultimately, closing SES-based educational achievement gaps will require a much more honest assessment of where we’re at as a country, a vision for the kind of country we want to be, and a willingness to implement the major policy changes needed to get there. Emma García is an education economist at the Economic Policy Institute, where she specializes in the economics of education and education policy. Her areas of research include analysis of the production of education, returns to education, program evaluation, international comparative education, human development, and cost-effectiveness and cost-benefit analysis in education. Prior to joining EPI, García conducted research for the Center for Benefit-Cost Studies of Education and other research centers at Teachers College, Columbia University, and did consulting work for the National Institute for Early Education Research, MDRC, and the Inter-American Development Bank. García has a Ph.D. in economics and education from Teachers College, Columbia University. Elaine Weiss was the national coordinator for the Broader, Bolder Approach to Education (BBA) from 2011 to 2017, in which capacity she worked with four co-chairs, a high-level task force, and multiple coalition partners to promote a comprehensive, evidence-based set of policies to allow all children to thrive. Weiss came to BBA from the Pew Charitable Trusts, where she served as project manager for Pew’s Partnership for America’s Economic Success campaign. Weiss was previously a member of the Centers for Disease Control and Prevention’s task force on child abuse and served as volunteer counsel for clients at the Washington Legal Clinic for the Homeless. She holds a Ph.D. in public policy from the George Washington University and a J.D. from Harvard Law School. The needs of children in Austin Independent School District (AISD) schools with the highest concentrations of poor, immigrant, and non-English-speaking families are supported through a combination of parent-organizing (schools with parent-organizing programs, led by the nonprofit Austin Interfaith, form a network of “Alliance Schools”), intensive embedding of social and emotional learning (SEL) in all aspects of school policy and practice, and the transformation of schools into “community schools” (i.e., schools that are hubs for the provision of academic, health, and social services). Organizing partners: Austin Interfaith (a nonprofit collaborative of congregations, public schools, and unions that is part of the national Industrial Areas Foundation [IAF]); the Collaborative for Academic, Social and Emotional Learning (CASEL); the American Federation of Teachers (AFT); and the National Education Association (NEA). Schools and students reached: The IAF/Alliance Schools network extended at its zenith into one-fourth of AISD elementary schools and one-half of AISD high-poverty elementary schools. CASEL worked in five high schools, and in the seven middle schools and 43 elementary schools that feed into these high schools, to embed social and emotional learning in school policies and practices. A middle school and a high school have been transformed into community schools and serve as models for planned districtwide expansion of the “community schools” strategy into all AISD schools. General makeup of the student body: In the district overall, 60 percent of students qualify for subsidized meals, i.e., are eligible for free or reduced-price lunch (FRPL); 28 percent are English language learners (ELLs); and 10 percent are special education students. In schools targeted for whole-child supports, relative to the general student body, students are poorer, more heavily minority and immigrant, and more likely to be living in single-parent households. Key features: Parent-organizing with teachers in Alliance Schools enables parents to partner with teachers to advocate for comprehensive supports for their children. Also, social and emotional learning (SEL) is embedded in all aspects of school efforts in the high schools and the feeder elementary and middle schools that worked with CASEL. Finally, health and other wraparound supports in high-needs middle and high schools, along with other community schools features, are expanding to additional district schools. Core funding: The district received a CASEL grant to embed social and emotional learning in school policies and practices, and it also received in-kind support from the NoVo Foundation in the form of technical assistance. The United Way of Greater Austin provides ongoing funds for wraparound support, and AFT and NEA fund community schools work and expansion. The City Connects program in Boston, Massachusetts, provides targeted academic, social, emotional, and health supports to every child in 20 of the city’s schools with the highest shares of low-income, black, Hispanic, and immigrant students. Organizing partners: Boston College Center for Optimized Student Support, Boston Public Schools (BPS), and community agencies. Schools and students reached: The 20 BPS schools in the program serve more than 8,000 of the city’s most disadvantaged students (out of 125 BPS schools and 56,000 students). General makeup of the student body: The 20 urban schools serve neighborhoods that are poor and racially and ethnically diverse, with a heavy concentration of Hispanic English language learners. Over 80 percent of the students in these schools are FRPL-eligible and roughly half do not speak English at home. Key features: School site coordinators in each school connect students with a tailored set of services and enrichment opportunities provided by a variety of public and private agencies. Universal state health care supports all students’ physical and mental health needs, and the city’s Universal Pre-Kindergarten (UPK) program now offers quality pre-K for all 4-year-olds in Boston. Core funding: In addition to school district budget revenue, federal Race to the Top funds allocated to City Connects help defray costs. Several private foundations support various aspects of City Connects’ work. The East Durham Children’s Initiative (EDCI) concentrates services and supports for children and their families living in a 120-block, heavily distressed area of concentrated poverty and high crime within the city. Organizing partners: Community leaders launched EDCI and engaged the Duke University Center for Child and Family Health to grow capacity. EDCI is now a fully staffed nonprofit that runs the initiative. Schools and students reached: The 120-block area targeted by EDCI serves students in two neighborhood elementary schools, one middle school, one high school, and two charter schools. General makeup of the student body: The 120-block area is urban and poor with a predominantly black but very diverse student body. In Durham schools overall, 66 percent of students are FRPL-eligible, nearly half are black, almost one-third are Hispanic, and 18 percent are white. Key features: EDCI is a place-based initiative modeled on the Harlem Children’s Zone, providing a pipeline of high-quality cradle-to-college-or-career services. These include early childhood supports (that complement state pre-K programs), health and mental health services, and after-school and summer enrichment activities. Core funding: EDCI has an annual fund receiving contributions from individuals, corporations, fundraising events, and private foundations; it neither seeks nor receives public funding. The Northside Achievement Zone (NAZ) is a Promise Neighborhood, a designation awarded by the U.S. Department of Education Promise Neighborhoods program to some of the most distressed neighborhoods in the nation. Through the program, children and families who live in the 13-by-18-block NAZ receive individualized supports. Organizing partners: NAZ, the Promise Neighborhood grantee organization, is guided by a 20-member board of directors consisting of local community leaders. Schools and students reached: The 13-by-18-block zone in North Minneapolis serves 5,500 students in 10 public, charter, and parochial K–12 schools, including one high school. General makeup of the student body: In this racially concentrated area of poverty, almost all residents are African American and median family income is $18,000. One-third of children are homeless or “highly mobile” (not technically homeless but without stable housing). Key features: “Connectors” are in essence case managers who help families develop achievement plans, and “Navigators” connect families with community resources to move toward goals. The zone offers access to high-quality pre-K and parenting supports, as well as mentoring, enrichment, college preparatory support, and after-school and summer programs. Core funding: NAZ is anchored by a federal Promise Neighborhood grant. NAZ also receives private grants and is able to leverage federal Race to the Top Early Learning Challenge funds to support pre-K scholarship slots. Through a collaboration between The Children’s Aid Society and the New York City Department of Education, 16 community schools in some of the most disadvantaged neighborhoods in three of the city’s five boroughs provide wraparound health, nutrition, mental health, and other services to students along with enriching in-and-out-of-school experiences, amplified by extensive parental and community engagement. Organizing partners: The Children’s Aid Society, the New York City Department of Education, the New York State Education Department, and other local and state agencies. Schools and students reached: Sixteen community schools in three boroughs serve some of the poorest immigrant and minority students in a school system of roughly one million students. General makeup of the student body: Students in Children’s Aid Society community schools are disadvantaged relative to the system overall, which serves a heavily low-income and minority student body: more than three-quarters of New York City public school students are FRPL-eligible, 13 percent are English language learners, and nearly one in five receive special education services. These schools also have high concentrations of students of color: 27 percent are African American and 41 percent are Hispanic. Key features: Close coordination with local and state education, health, and other agencies along with community partnerships at each school enables wraparound health, mental health, and after-school and summer enrichment, as well as deep parent and community engagement. Core funding: A range of public dollars, including federal Elementary and Secondary Education Act (ESEA) Title I funds and funds from the federal 21st Century Community Learning Centers program, together with state and local funding for after-school and other programs, is supplemented by funds from individuals and foundations. The Tangelo Park Program (TPP) provides cradle-to-college support for all children residing in Orlando’s high-poverty, heavily African American Tangelo Park neighborhood. Organizing partners: The Tangelo Park Program board, along with Harris Rosen (the hotelier who envisioned and funds the program), work in close collaboration with the Tangelo Park Civic Association and the University of Central Florida. Schools and students reached: The program serves all children in the Tangelo Park neighborhood. General makeup of the student body: Virtually all residents in the low-income neighborhood are African American or Afro-Caribbean. Key features: Universal college scholarships—called “Promise” scholarships because they are guaranteed by an established fund—are supported by quality neighborhood-based early childhood education, health, counseling, and after-school and summer programs. Core funding: Harris Rosen funds early child care providers and universal college scholarships. Rosen also supports other services, such as a lifeguard at the YMCA, as needed. Joplin’s Bright Futures initiative (which has spawned dozens of other Bright Futures affiliate districts under a Bright Futures USA umbrella since it launched in 2010) has a rapid response component that addresses children’s basic needs (within 24 hours of a need being reported), while strong school–community partnerships help meet students’ longer-term needs. Bright Futures also provides meaningful service learning opportunities in every school. Organizing partners: The Joplin School District’s superintendent and top leadership, in collaboration with parents and community, faith, business, and social service leaders. Schools and students reached: Bright Futures serves all of the district’s 7,874 students in all 17 schools. General makeup of the student body: Joplin is a heavily white community. As of 2015, nearly two-thirds (61 percent) of Joplin students are FRPL-eligible and 16 percent are classified as needing special education; just 3 percent are English language learners. Key features: The Bright Futures USA framework has three components. First, a rapid response system is designed to meet any student’s basic health, nutrition, or physical need within 24 hours of such a need being reported; this system is supported by combined resources from social service agencies, businesses, faith organizations, and individual community members. Second, school- and community-level councils build community leadership and partnerships with schools to meet longer-term needs and sustain systems. Third, service learning opportunities are embedded in all schools to help develop children as citizens. Teachers lead the service learning and receive training to do so. In addition to these three components, Joplin also provides pre-K for at-risk students, as well as tutoring, mentoring, and after-school and college preparatory programs based on student need. Core funding: Federally funded Americorps VISTA volunteers provide in-kind support; funds from the Missouri Department of Elementary and Secondary Education and the Missouri Department of Economic Development support Bright Futures work and conferences; and the regional Economic Security Corporation and a range of private funders supplement these federal and state funding sources. The “Kalamazoo Promise,” a guarantee by a group of anonymous local philanthropists to provide full college scholarships in perpetuity for graduates of the district’s public high schools, brought Kalamazoo Public Schools (KPS), the city, and the community together to develop a set of comprehensive supports that enable more students to use the scholarships. Organizing partners: Kalamazoo Promise and Kalamazoo Public Schools, the local school district, in collaboration with Communities in Schools Kalamazoo (CIS) and other nonprofit entities. Schools and students reached: All KPS students (12,216 in 25 schools) who graduate from Kalamazoo public high schools are eligible for Promise scholarships. CIS works in all schools but to varying degrees and with varying levels of financial support. General makeup of the student body: In this combination urban–suburban district, a large majority of students (over 70 percent) are FRPL-eligible, 12 percent receive special education services, and 7 percent are English language learners. The share of African American students grew from less than one-third in 1987 to over half 30 years later; over this period the share of Hispanic students increased as well. Key features: The anchor for comprehensive supports is universal “Promise” college scholarships, which have spurred community leadership to provide quality pre-K programs and wraparound health, mental health, and other supports, and to launch a districtwide effort to create a college-going culture and resources to support that culture. Core funding: Anonymous donors have committed to funding Promise scholarships in perpetuity. CIS is supported by a combination of Title I funding, which helps support school coordinators; 21st Century Learning grants for after-school activities; and private individual and philanthropic donations. All students in Montgomery County Public Schools (MCPS) benefit from zoning laws that advance integration and strong union–district collaboration on an enriching, equity-oriented curriculum. These efforts are bolstered by extra funding and wraparound supports for high-needs schools and communities. Organizing partners: MCPS, the Montgomery County Education Association (the local teachers union), the Montgomery County Council, and Linkages to Learning (a joint initiative of MCPS and the Montgomery County Council that provides an integrated focus on health, social services, community development, and engagement to support student learning, strong families, and healthy communities). Schools and students reached: All 160,000 students in more than 200 schools are served via some services. Higher-poverty schools and their communities receive additional funds and supports that are broader and more intensive. For example, Linkages to Learning serves more than 5,400 individuals—students and their family members—per year at 29 schools. Over 3,700 of them receive comprehensive behavioral health or social wraparound services to mitigate the effects of poverty and reduce nonacademic barriers to learning. General makeup of the student body: The MCPS school district as a whole is racially and socioeconomically diverse: 30 percent of students are Hispanic, 29 percent are white, 22 percent are African American, 14 percent are Asian, and 35 percent are FRPL-eligible (more than 40 percent of students have been FRPL-eligible at some point). On the poorer, Eastern side of the county, where more intensive whole-child supports are provided, the 10 highest-poverty schools have student bodies that are at least 80 percent FRPL-eligible. Key features: Mixed-use housing policies that enable racial and socioeconomic integration advance school-level integration that boosts low-income students’ learning, which the district enhances through various forms of support, including high-quality early childhood education, parent and community outreach, reallocation of funds to high-needs schools and students, nutrition and health services, and an emphasis on social and emotional learning. Core funding: MCPS is heavily locally funded, with almost no federal Title I dollars. The district’s whole-child approach draws on a combination of school district and county revenues, along with federal funding for Head Start programs, state pre-K dollars, and assorted other grants. The Pea Ridge School District, a small suburban–rural district outside Fayetteville, Arkansas, is among the newer affiliates of Bright Futures USA, a national umbrella group that grew out of Bright Futures Joplin. As a Bright Futures affiliate, Pea Ridge is making good progress toward identifying and meeting students’ basic needs, engaging the community to meet longer-term needs, and making service learning a core component of school policy and practice. Organizing partners: Pea Ridge School District and Bright Futures USA. Schools and students reached: Eight hundred and fifty students are served in one primary school, one elementary school, one middle school, and one high school, as well as an alternative high school and a new career-tech charter high school. General makeup of the student body: The suburban–rural district is mostly white, with a small but growing Hispanic population, and predominately middle-income with pockets of both higher-income families and families in poverty. Key features: The first component of the three-part Bright Futures USA framework is a rapid response system to meet every student’s basic health, nutrition, and physical needs within 24 hours through a combination of social service agency, business, faith, and individual community contributions. Other components include school- and community-level councils, which build community leadership and partnerships with schools to meet longer-term needs and sustain systems, and service learning embedded in all schools that is enhanced by supportive training for teachers. Pea Ridge also provides pre-K for at-risk students, as well as tutoring, mentoring, and after-school and college preparatory programs for students who need them. Core funding: State funds support meals and other needs for high-poverty schools, and Pea Ridge has secured a three-year private grant to support access to pre-K for low-income students. Family and Community Resource Centers (FCRCs) currently serve 16 of the highest-needs Vancouver Public Schools (VPS) district schools, with mobile and lighter-touch support in other schools and plans to expand districtwide by 2020. Organizing partners: School district leaders coordinate the program with the support of six central-office staff (three of whom just support FCRCs). Technical and other assistance is provided by the Coalition for Community Schools. Schools and students reached: FCRCs serve 23,500 students in 16 VPS schools: 11 elementary schools, two middle schools, two high schools, and the Fruit Valley Community Learning Center (a combination elementary school and community center that also offers child care and Head Start programs). Plans are being made to expand FCRCs to all 35 VPS schools by 2020. General makeup of the student body: As of 2015, more than half of students in VPS schools were FRPL-eligible, with FRPL-eligibility rates in some central-city schools exceeding 80 percent. More than one in five students speak a language other than English at home, and 12.5 percent of students are special education students; in FCRC schools, the shares of non–English speakers and special education students are even higher. Key services: VPS supports a range of early childhood education programs, including quality pre-K; middle and high school in-school enrichment; after-school and summer programs (provided by VPS partners); and help for parents and families through workshops, assistance, and referrals to a range of community resources. Core funding: District and Title I funds, which support basic FCRC needs, are supplemented by cash and in-kind donations from faith-based, social service, business, and association partners. Organizing partners: Berea College launched Partners for Education (PfE), which is now a fully staffed nonprofit that runs the initiative. Schools and students reached: PfE serves 35,000 students in 22 schools in Clay, Jackson, Knox, and Owsley counties; tens of thousands more are served less intensively in an additional 23 counties in the region. General makeup of the student body: The Appalachian region is rural, very poor, and heavily white. The regional poverty rate is around 27 percent (in 2015) and reaches as high as 40 percent in some counties. About 80 percent of students are FRPL-eligible and 97 percent are white. Key features: Family engagement specialists meet directly with families and help coordinate services provided by a range of community partners. Other specialists provide basic academic, college preparatory, and health and other wraparound services to students. Core funding: Federal Promise Neighborhood, Full Service Community Schools, and Investing in Innovation grants are the most prominent sources of funding, but the initiative receives a range of other cash and in-kind supports. 1. Economic Policy Institute, Inequality.is [interactive website], 2013; Lawrence Mishel and Jessica Schieder, Stock Market Headwinds Meant Less Generous Year for Some CEOs, Economic Policy Institute, 2016; Emmanuel Saez, Striking it Richer: The Evolution of Top Incomes in the United States (Updated with 2015 Preliminary Estimates), University of California Department of Economics, 2016. 2. Raj Chetty, David Grusky, Maximilian Hell, Nathaniel Hendren, Robert Manduca, and Jimmy Narang, “The Fading American Dream: Trends in Absolute Income Mobility since 1940,” National Bureau of Economic Research Working Paper no. 22910, 2016. Other research has found that there is less social mobility in the United States than in other developed countries; see Lawrence Mishel, Josh Bivens, Elise Gould, and Heidi Shierholz, The State of Working America, 12th Edition, An Economic Policy Institute Book (Ithaca, N.Y.: Cornell Univ. Press, 2012). 3. Robert Putnam, Our Kids: The American Dream in Crisis (New York: Simon and Schuster, 2015); Diane Schanzenbach, Megan Mumford, Ryan Nunn, and Lauren Bauer, Money Lightens the Load, The Hamilton Project, Brookings Institution, 2016; Silvia Stringhini et al., “Socioeconomic Status and the 25×25 Risk Factors as Determinants of Premature Mortality: A Multicohort Study and Meta-Analysis of 1.7 Million Men and Women,” The Lancet, March 25, 2017 (published online January 31, 2017). 4. See, among others, G.J. Duncan, P.A. Morris, and C. Rodrigues, “Does Money Really Matter? Estimating Impacts of Family Income on Young Children’s Achievement with Data from Random-Assignment Experiments,” Developmental Psychology vol. 47, no. 5, 1263–79; Emma García and Elaine Weiss, Early Education Gaps by Social Class and Race Start U.S. Children Out on Unequal Footing: A Summary of the Major Findings in Inequalities at the Starting Gate, Economic Policy Institute, 2015; Emma García, Inequalities at the Starting Gate: Cognitive and Noncognitive Skills Gaps between 2010–2011 Kindergarten Classmates, Economic Policy Institute, 2015; Lawrence Mishel, Josh Bivens, Elise Gould, and Heidi Shierholz, The State of Working America, 12th Edition, An Economic Policy Institute Book (Ithaca, N.Y.: Cornell Univ. Press, 2012); and Robert Putnam, Our Kids: The American Dream in Crisis (New York: Simon and Schuster, 2015). 5. Gregory J. Duncan and Richard Murnane, “Introduction: The American Dream, Then and Now,” in Whither Opportunity: Rising Inequality, Schools, and Children’s Life Chances, Greg J. Duncan and Richard Murnane, eds. (New York: Russell Sage Foundation, 2011); Frances L. Van Voorhis, Michelle Maier, Joyce L. Epstein, and Chrishana M. Lloyd, The Impact of Family Involvement on the Education of Children Ages 3 to 8: A Focus on Literacy and Math Achievement Outcomes and Social-Emotional Skills, MDRC, 2013; Sean F. Reardon, “The Widening Academic Achievement Gap between the Rich and the Poor: New Evidence and Possible Explanations,” in Whither Opportunity? Rising Inequality, Schools, and Children’s Life Chances, Greg J. Duncan and Richard Murnane, eds. (New York: Russell Sage Foundation, 2011), 91–116; Leila Morsy and Richard Rothstein, Parents’ Non-Standard Work Schedules Make Adequate Childrearing Difficult: Reforming Labor Market Practices Can Improve Children’s Cognitive and Behavioral Outcomes, Economic Policy Institute, 2015. 6. See references in Emma García and Elaine Weiss, Making Whole-Child Education the Norm: How Research and Policy Initiatives Can Make Social and Emotional Skills a Focal Point of Children’s Education, Economic Policy Institute, 2016. 7. The differences are 1.17 and 1.25 standard deviations, respectively, or 0.94 and 0.91 standard deviations after controlling for clustered data. Clustering takes into account the fact that children are not randomly distributed but tend to be concentrated in schools or classrooms with children of the same race, social class, etc. 8. While the social and emotional skill levels as measured by teachers are similar to the social and emotional skill levels as measured by parents, how teachers assess the skills likely differs from how parents do. Teachers likely evaluate their students’ skill levels relative to those of other children they teach. Parents, on the other hand, may be basing their expectations on family, community, culture, or other factors. In 2010, children in the high-SES quintile scored 0.4 and 0.5 standard deviations higher in self-control and approaches to learning as reported by teachers than children in the low-SES quintile. Using parents’ assessments of the same skills, the gaps are 0.4 and 0.6 standard deviations, respectively. 9. Richard Rothstein, Class and Schools: Using Social, Economic, and Educational Reform to Close the Black-White Achievement Gap (Washington, D.C.: Economic Policy Institute; New York: Columbia Univ. Teachers College, 2004). 10. It is also possible that increased quality in the programs that low-SES children attended improved their readiness. These data, however, which are from the National Institute of Early Education Research State of Preschool yearbook and pages for each of the states, suggest that increases in quality took place in a small subset of states and did not serve enough poor children to substantially influence these data. See Steven Barnett et al., The State of Preschool 2016, National Institute for Early Education Research at Rutgers University, Newark, N.J., 2017. 11. For the link between children’s health and school readiness, see U.S. Department of Health and Human Services and U.S. Department of Education, Policy Statement to Support the Alignment of Health and Early Learning Systems (2016); Janet Currie, “Healthy, Wealthy, and Wise: Socioeconomic Status, Poor Health in Childhood, and Human Capital Development,” Journal of Economic Literature vol. 47, no. 1 (2009), 87–122; AAP Council on Community Pediatrics, “Poverty and Child Health in the United States,” Pediatrics vol. 137, no. 4 (2016). pii: e20160339. 12. It also had less of a negative effect on children’s self-control in 2010 than it had earlier. Note that the pre-K measure is a crude one—it records only whether a child attended a center-based program but says nothing about the program’s size or quality, or about the teacher’s qualifications—so positive impacts of high-quality programs are probably underestimated here, while some negative impacts of poor-quality programs may be muted. 13. For the sources of the facts regarding the eight case studies that were published at the time of this paper’s release, see “BBA Case Studies” on the Broader, Bolder Approach to Education website. For the sources of the facts regarding those case studies that were not yet published (Austin, Texas; Kalamazoo, Michigan; Montgomery County, Maryland; and Tangelo Park in Orlando, Florida), see Emma García and Elaine Weiss, Education Inequalities at the School Starting Gate: Gaps, Trends, and Strategies to Address Them, Economic Policy Institute and the Broader, Bolder Approach to Education, 2017. The Broader, Bolder Approach to Education (BBA) is a national campaign that employs poverty-mitigation strategies grounded in community engagement to level the educational playing field and ensure meaningful opportunities for all children to thrive. See boldapproach.org. 14. Art Rolnick and Rob Grunewald, “Early Childhood Development: Economic Development with a High Public Return,” The Region vol. 17, no. 4 (2003), 6–12; Ajay Chaudry, Taryn Morrissey, Christina Weiland, and Hirokazu Yoshikawa, Cradle to Kindergarten: A New Plan to Combat Inequality, Russell Sage Foundation, 2017. 15. Healthy Kids. Successful Students. Better Communities, a presentation published online by the U.S. Centers for Disease Control and Prevention, draws on dozens of sources to present a comprehensive picture of the threats to academic success posed by lack of strong health and the many ways that healthy eating, exercising, and other activities that promote child well-being drive success in school. 16. T.K. Peterson, ed., Expanding Minds and Opportunities: Leveraging the Power of Afterschool and Summer Learning for Student Success. (Washington, D.C.: Collaborative Communications Group, 2013). 17. See, e.g., Shelia Smalley and Maria Reyes-Blanes, “Reaching Out to African American Parents in an Urban Community: A Community-University Partnership,” Urban Education vol. 36, no. 4 (September 2001). 18. Elaine Weiss, “City Connects (Boston, MA)” [case study], Broader, Bolder Approach to Education, February 17, 2016. 19. This is the fundamental premise of Maslow’s hierarchy of needs: that until basic or foundational needs—for food, clothing, shelter, health care, and nurturing—are met, higher-order needs, such as the need for complex learning, remain out of reach. This idea is borne out by research by Richard Rothstein and many other scholars of health, poverty, and neuroscience, among others. See Richard Rothstein, Class and Schools: Using Social, Economic, and Educational Reform to Close the Achievement Gap (Washington, D.C.: Economic Policy Institute; New York: Columbia Univ. Teachers College, 2004). 20. In recent years, a growing number of reports have emerged that some charter schools—which are technically public schools and often tout their successes in serving disadvantaged students—keep out students unlikely to succeed through complex application processes, fees, parent participation contracts, and other mechanisms, and then further winnow the student body of such students by pushing them out when they prove to be academically or behaviorally challenging. For more on this topic, see “In Reforming New Orleans, have Charter Schools Left Some Students Out?”—a 2015 PBS NewsHour investigation of charter schools that refuse entry to hard-to-teach students and suspend high shares of those they admit; Network for Public Education executive director Carol Burris’ article on Arizona’s BASIS school chain, “What the Public Isn’t Told About High-Performing Charter Schools in Arizona” (published on The Washington Post’s Answer Sheet blog, March 30, 2017); and Stephanie Simon’s national assessment for Reuters, “Class Struggle—How Charter Schools Get Students They Want,” February 15, 2013. 21. See School Turnaround: A Pocket Guide, American Institutes for Research, 2011. The models, in order of severity (from lightest to most stringent), are termed “transformation,” “turnaround,” “restart,” and “closure” (see page 3). 22. Sarah D. Sparks, “Billions in School Improvement Spending but Not Much Student Improvement,” EdWeek, January 19, 2017. 23. Evidence of steadily increasing income inequality and the severity of the Great Recession can be found in “Overview: Policy-Driven Inequality Blocks Living-Standards Growth for Low- and Middle-Income Americans,” in The State of Working America, 12th edition, An Economic Policy Institute Book (Ithaca, N.Y.: Cornell Univ. Press, 2012); Economic Policy Institute, Inequality.is [interactive website], 2013; Emmanuel Saez, Striking It Richer: The Evolution of Top Incomes in the United States (Updated with 2015 Preliminary Estimates), 2016. 24. Steven Barnett et al., The State of Preschool 2016 (Newark, N.J.: National Institute for Early Education Research at Rutgers University, 2017). See, in particular, the executive summary beginning on page 6. 26. Emma García and Elaine Weiss, Early Education Gaps by Social Class and Race Start U.S. Children Out on Unequal Footing: A Summary of the Major Findings in Inequalities at the Starting Gate, Economic Policy Institute, 2015. 27. Research shows that for children living in the lowest-income households, increasing their parents’ incomes to above the federal poverty line during their formative early years had lasting educational and other benefits. See Gregory J. Duncan, Katherine A. Magnuson, and Elizabeth Votruba-Drzal, “Boosting Family Income to Promote Child Development,” Future Child vol. 24, no. 1 (2014), 99–120. 28. Extensive research has demonstrated that these programs help ensure that children do not suffer the effects of poverty. See, for example, Danilo Trisi, “Safety Net Cut Poverty Nearly in Half Last Year, New Census Data Show,” Off the Charts (Center on Budget and Policy Priorities blog), October 16, 2014; and Sarah Steinberg, The Safety Net Is Good Economic Policy, Center for American Progress, 2014. In fact, Economic Policy Institute studies find that the EITC alone lifts more people out of poverty than any other single government program except for Social Security; see Josh Bivens et al., It’s Time for an Ambitious National Investment in America’s Children, Economic Policy Institute, 2016; and Thomas Hungerford and Rebecca Thiess, The Earned Income Tax Credit and the Child Tax Credit: History, Purpose, Goals, and Effectiveness, Economic Policy Institute, 2013. 29. Raising the minimum wage to $15 in 2024 would benefit nearly one-quarter of U.S. children (19 million have at least one parent who would get a raise). See Economic Policy Institute, How Raising the Minimum Wage to $15 by 2024 Will Benefit Women [fact sheet], May 25, 2017. 30. See Raj Chetty et al., The Fading American Dream: Trends in Absolute Income Mobility since 1940, NBER Working Paper no. 22910, National Bureau of Economic Research, 2016; and Economic Policy Institute, The Agenda to Raise America’s Pay, last updated December 6, 2016.